It is possible to take part in a guided tour of the “Spodek” Sports and Entertainment Arena upon prior registration. An icon not only of Katowice, but also of Polish modernist architecture. A symbol of great music events, sport games and exhibitions, forever engraved in the memory of anyone who has had the chance to visit. It is to the Spodek that the Polish volleyball team went after their World Championship title; basketball players and athletes strove for top European honours; hockey players defeated Russians; while other sportsmen and hundreds of thousands of fans lived unforgettable moments. It is at the Spodek that we have witnessed concerts by the likes of Metallica, Joe Cocker, Tina Turner, Brian Adams, Elton John, Deep Purple, The Cure, Genesis, Robert Plant and Jimmy Page, Black Sabbath, Mike Oldfield, Rammstein, Iron Maiden, Robbie Williams, Depeche Mode and Korn. Come and experience those interesting corners of Spodek that are usually closed to the public. 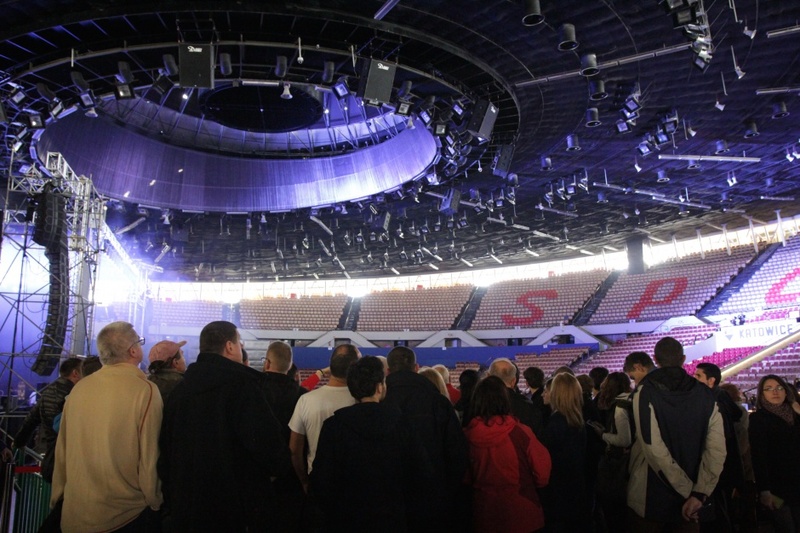 We have prepared a special guided tour full of historical trivia and anecdotes to take you through the sports facilities of Spodek and the main hall with all its interesting nooks and crannies. Visitors will find out where the stage is stashed away and how sliding sectors work. They will get to sneak a peek into the VIP rooms used by celebrities when resting during Spodek events. We will also show you where police officers sit and let you try out the comfortable plush seats of the VIP box. For safety reasons, the guided tour does not include the ceiling and the roof. Admission is PLN 5 per person. Children up to 7 years of age can take part free of charge. Each participant receives a souvenir ticket. Come join us for guided tours on 15 January and 12 February at 12:00 pm, 1:30 pm, 3:00 pm and 4:30 pm.